Caddie tells Kuchar to stick his money. Re: Caddie tells Kuchar to stick his money. I can see GPB's point regarding an agreement before they played. I just think the original agreement was mean. The fact that Kuchars' agent has now offered $15,000 of Kuchars money only emphasizes how bad it was. If they had an agreement before the first round how much the caddie would be paid, then I don't really understand the fuss. $5000 doesn't seem much in the scheme of things when you win $1.3 million, but then again, if that's what's agreed then so be it. Surely the thing to do is to agree what you are going to be paid before the first tee shot, with a proviso that if your man wins you get 10%. The guy is a caddie, enough said. Couldn't believe this was true when the story first came out, but Kuchar is making himself look more like a pillock with every new revelation. Why these millionaires+ can't adhere to an established formula for caddie payments when their own "man" is elsewhere beggars belief. John Wood is a highly regarded caddie and would doubtless be on the receiving end of 10% or 15%, whatever is in their contract. But he wasn't there, as far as I know had never won anything (except also-ran money) with Kuchar and, just maybe, Mac's pereceptive comment acknowledged, actually helped Kuchar "get it over the line". I’m a bit split on this. Obviously they had an agreement and Kuchar had struck a similar deal with another Mexican caddie at another tournament. So there was some sort of precedent and this seemed to be the right level. It would be crazy if Kuchar gave him 130k when they agreed 4k. I’m sure other players with local caddies would have been bit miffed, especially if they had a high finish. The other local caddies as well. On the other hand an extra bonus of say 10-20k would have been more appropriate. I'm at a loss to understand why the treatment/remuneration of a caddie at a PGA Tournament in Mexico would ever be expected to differ from that in the US. Is the 10% rate for caddies even a confirmed number? It seems like a Poopie load of money for just carrying a bag? An agreement's an agreement, but it doesn't reflect well on Kuchar. Smacks of him taking advantage of someone he knew would be unaware of the normal going rate. My take on this. Kuchar took advantage of the caddies naivety. The caddie should never have agreed a one-off figure regardless of the result. The more Kuchar talks about this the deeper the hole he is digging for himself. It's a PR disaster for him which he needs to rectify. McLaren wrote: The guy is a caddie, enough said. Fair point Mac. Almost to a man, every one I have ever met has been a halfwit. 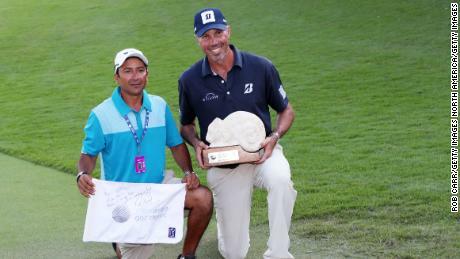 Rather parsimonious from the grinning goon Kuchar though, you'd think that with his winnings he might have tucked a few extra quid in the envelope. Miser. 4k for a top 10, with the offer of a unspecified amount as a win bonus. He tossed him an extra grand. Agreement or not, it makes Kuchar look like a bit of a cok. 4putt, don’t think the caddie was naive. It was the going rate. If he turned down the 4k somebody else would have jumped on. And don’t tell me El Toucan doesn’t know what PGAT caddies earn. He also knew Kuch is a top player who had a realistic chance of winning. But why would Kuch go in and offer a significantly better deal than the market rate? Other players and caddies alike would have been pissed. Should golfers suddently turn into SJWs? With that being said I agree Kuchar should have ponied up a bit more now that he actually won. Super apparently needs PhDs to caddy for him. Davie wrote: Super apparently needs PhDs to caddy for him. Another asperger would be better: turn up, keep up and shut up. El Toucans face just says it all: WTF? I'm really going to take a diagnosis off someone on a bloody forum aren't I? For Kuchar it's a PR disaster, but will blow over almost instantly. You're never going to pay a local, one time, expense low caddy the same amount as a career looper that has expenses to pay year-round. Agreeing 3/4/5k beforehand is sensible from Kuchar, although I would expect both sides to add tiering for placings. Twenty grand win bonus (making 25 total), 10 grand top ten (or top 5). But, as pointed out, why would Kuchar go more than he did when there would have been a queue of local, happy to take flat rate guys equally capable of carrying a big bag for 28 miles over 4 days. Does anyone know the extent of the caddy's input? I doubt he gave the same service as his regular looper. Bit surprised Mac hasn't called Kuchar full blown racist to be honest. Roller_Coaster wrote: Bit surprised Mac hasn't called Kuchar full blown racist to be honest. Caddies are a hard bunch to feel sympathy for. So, just because you have little sympathy for caddies, they deserve to be treated worse because of the colour of their skin? Sergio is turning in his bunker. It might be the case for super, but for me caddies are generally bullshitting fantasists and it has nothing to do with skin colour. How many professional caddies do you know, Mac? I don't mean part-timers like Tucan, but the John Woods, Tony Navarros, Ricky Elliotts of this world. Over here, at least, a high proportion of the Tour caddies are accomplished golfers in their own right - like John Rollins who was scheduled to work for Hunter Mahan last week, but got into the field, and made the cut, whilst Hunner missed out. Dunno about American caddies, but those over here (on the ET, mainly British) all seem to be of the same breed of unshaven, fat-ish, rough mannered, 40-fags-a-day lowlifers. At least that’s my unscientific anslysis after having attended the odd couple of ET events in person. Possibly peds, but I bet not many of that ilk carry the bag for successful pros. Odd as it may seem, I actually agree with you that a too caddie can make a real difference. Rory for example would have a few more wins if he put Steve Williams on the bag. Just someone to stop the round feeling like a buddies match. As you say the type of caddie that me, super and pedro have taken a dislike to isn't getting a top guys bag. 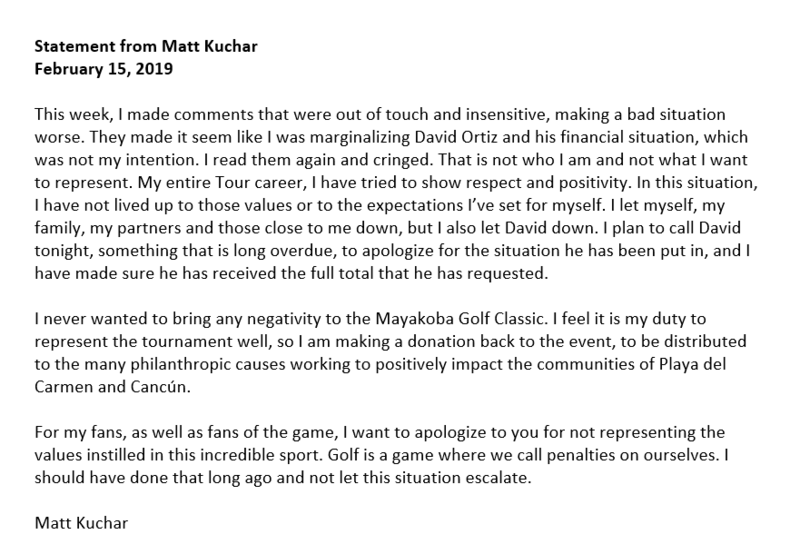 Kuch's latest statement. I would say this should probably be the end of the affair. Think El Tucan thought he should have got 50k. So it’s probably 50k minus the original 5k. Most of the caddies I've ever encountered are fine upstanding people. Every now and again though I have seen the dark side - which always seems to have involved a massive night out, beer, curries, whisky, cigarettes and (allegedly) nymphomaniac women. One guy paid extended visits to the Wentworth bushes several times during a round, another smelt like a Bombay bog right from the first tee (and it got significantly worse as we progressed), and a third blew chunks into the pond at The Grove, before dumping the bag and disappearing off towards Watford never to be seen again. Turn up, keep up and shut up is fine for most people, and the minimum standard really. George1507 wrote: Most of the caddies I've ever encountered are fine upstanding people. Every now and again though I have seen the dark side - which always seems to have involved a massive night out, beer, curries, whisky, cigarettes and (allegedly) nymphomaniac women. One guy paid extended visits to the Wentworth bushes several times during a round, another smelt like a Bombay bog right from the first tee (and it got significantly worse as we progressed), and a third blew chunks into the pond at The Grove, before dumping the bag and disappearing off towards Watford never to be seen again. So true, lost count of the number of tourists I've played with at St.Andrews who have said the caddie and their incessant "advice" ruined their experience. They ought to ask if they want advice or not, and just not assume, especially when the information they are giving is frequently nonsense. George1507 wrote: and a third blew chunks into the pond at The Grove, before dumping the bag and disappearing off towards Watford never to be seen again. Lets hope "chunks" was not the name of a dog! Good point GPB. With Michael Jackson you never really knew what “blew bubbles” meant.